This is a twist on a classic italian dish – Chicken parmesan. The twist is that it is healthy! The chicken is not breaded and fried, instead is ground up and treated as ground chuck – sauteed until browned in a pan. Essentially I made a meat sauce, but with chicken. 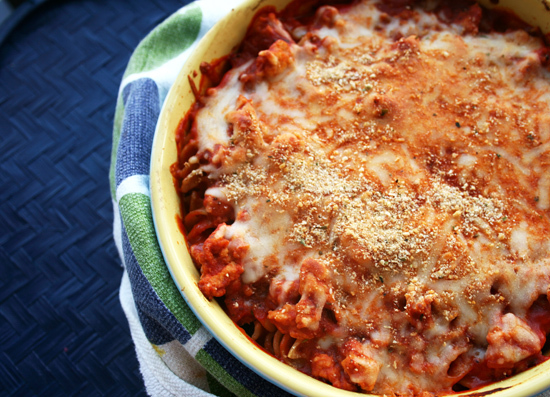 And, since chicken parmesan is traditionally paired with pasta, I made it into a (whole wheat) pasta bake! I love bakes because they are perfect for weeknight meals along with a salad and is great re-heated the next day. And the next. And the next! The sauce is made up of tomato paste, fresh garlic, oregano, and thyme. Oh, and I was out of parmesan for the top but used mozzarella throughout. 1 Heat pan over medium heat with some olive oil. Cook diced onion until softened. Then, mix in minced garlic. 2 Place ground chicken into same pan and break up with back of wooden spoon. Cook until no longer pink. 3 Pour tomato paste, milk, water, broth into pan and stir. Mix in thyme and oregano. 4 While sauce is simmering, boil water for pasta and cook until al dente- about 12 minutes. 5 Prepare a casserole dish and layer as follows: Half of pasta, half of cheese, half of sauce, then continue in that order again. Top with breadcrumbs and bake in oven for about 25 minutes or until cheese is gooey and melted and heated through. How easy is that?! This sounds excellent! Great idea to use the whole wheat pasta too! Sweet sassy molassy that looks awesome. Oh, that's one of my favorite dishes! Yummy looking! I love this healthy take on one of my very favorite dishes. Using ground chicken is a great idea. THANK YOU SO MUCH for your wonderful comment, can't tell you how much it means to me! Healthy Chicken Parm, I'm all over this one! My man who I affectionately refer to as "The Italian" does most of the cooking and I'm sure he would enjoy a healthy version of one of his favorite dishes too! that's one to add to my menu rotation! I love that this is healthy, sometimes chicken parmesan can be so fattening. It looks delicious! MMMMM..super delicious! I love the yummie flavours! WOOWWW THis looks to die for! YUMMY! Definitely want to try since the twist is for health! Oh, this looks SO yummy! Love this lightened up version. It's one of my favorite comfort food dishes! I love this. Simple & a dish in one...great comfort food! This sounds wonderful and easy! I'll definitely be giving it a try. Now that the kids are out of school meals are going to be a chore. Your blog is a great mix of fine cuisine and homemaking! How refreshing and...alternative! I was wondering if I could try this dish with Italian Turkey Sausages. If so, do I have to add or takeaway any of the ingredients in the list. Yes I think turkey sausage would be fantastic! made this for the boyfriend and myself the other night! perfect amount of cheese for me - I loved how it all incorporated and mixed together. This was also my first time to use chicken as a base in italian meatsauce, and I loved that too (leftovers are even better!). I did, however, think there was a bit too much oregano for the amount of sauce made for my taste. I also added salt/pepper. This is something I'll definitely keep making in the future. How easy would it be on a busy night to pour a jar of sauce over the chicken and mix it all up? Thanks again for the fun idea!